If any of you remember the Silver Palate Cookbook, the girls used to make these great hors d'oeuvres by rolling out crustless white bread slices and rolling w/ asparagus spears and cheese (add in some ham, delish). The rolled out store bought bread was magical. Brushed with some melted butter, it made a crispy treat, perfect for your 1980's party. Who uses white bread anymore, really? I suggest you use some of that Pepperidge Farm or Arnold white bread for this (you must have a loaf hiding in the back of the freezer for grilled cheese emergencies), because I think it would work best. However, I have whole grain and rye always, so it was a bit more challenging, making the oval slices fit into muffin tins. 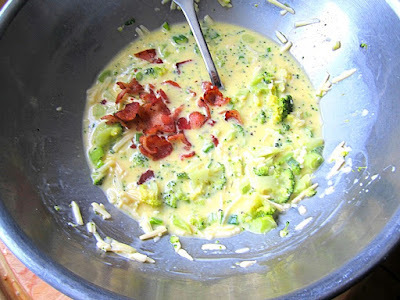 The fillings are optional, I had leftover cooked broccoli, and some scallions in the crisper drawer, but feel free to use sauteed onions and any other vegetable or herb. These are wonderful. 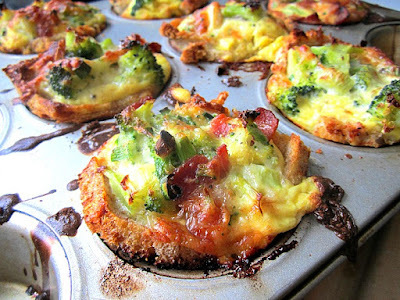 Make sure you let them rest in the muffin tin for 5 minutes only, or they will stick, I promise. Brush some melted butter (or cooking spray) in a muffin tin with 8 molds. Roll out the bread slices (crusts removed) and cut circles with a tomato can (24oz. 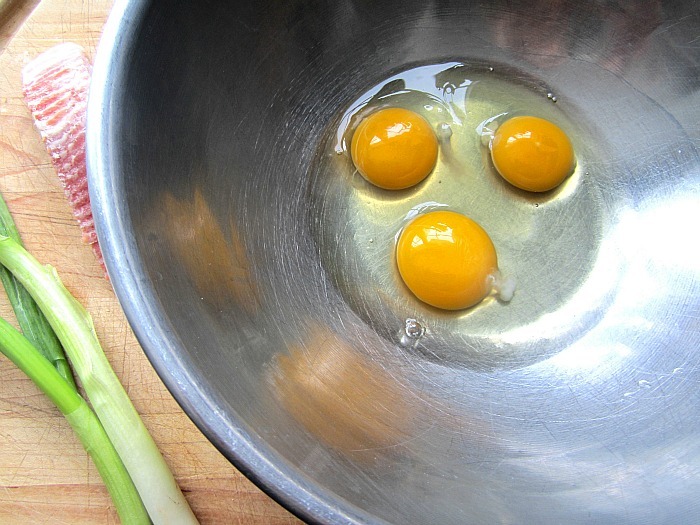 size works best), or large cookie cutter, to make circles. 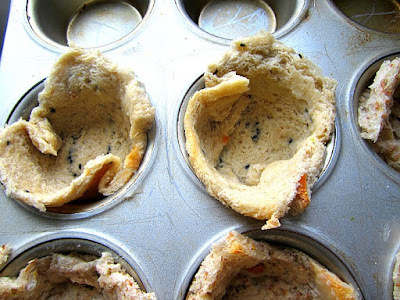 Fit each circle of bread into the greased muffin molds. Brush w/ the rest of the melted butter. Bake the bread cups for about 5 minutes until they are no longer soft. Mix the eggs, with the cheese, vegetables, eggs, milk and s&p. Add in the cooked bacon to the custard. 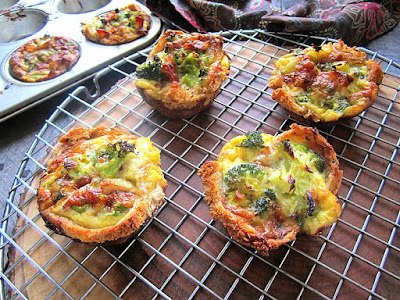 QUICKLY (so the bread cups don't get soggy), pour in about 2 tbsp of custard into each muffin cup. Bake about 30 minutes, until puffed and golden. Let rest only 5 minutes in the tin, then run a knife around the edges and carefully remove to a cooling rack. Yum. Who cares how the bread looks when you’re eating these that fast?!!!! Clever idea. 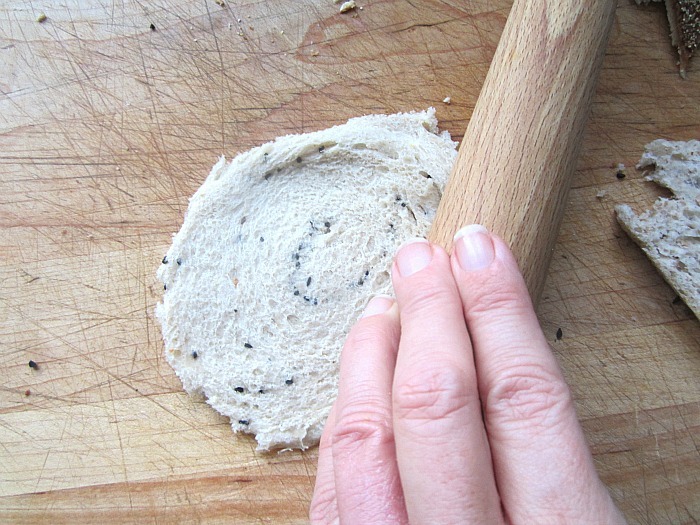 Your bread looks like it has swirls of herbs mixed into it. 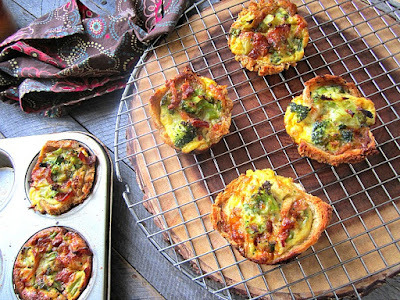 I have been making little crustless quiche in muffin tins as part of the effort to eat healthy but these look much better. Little kids would love the bread...easy to hold! I can't remember the last time I used our muffin tin to make muffins. I generally make fun desserts (not muffins) or meat dishes in it. Love this idea!